Automate the app deployment process for the various stages of development, for example, builds for test, beta releases and the App Store. fastlane lets you define and run your deployment pipelines for different environments. It helps you unify your app’s release process and automate the whole process. fastlane connects all fastlane tools and third party tools, like CocoaPods and xctool. Visit fastlane.tools to read more about the tool. CocoaPods 0.36 will bring the long-awaited support for Frameworks and Swift. It isn’t released and considered stable yet, but a beta is now available for everyone via [sudo] gem install cocoapods --pre. Pod authors will especially want to try this version to make sure their pods will work with the upcoming release. This is because if a single dependency in a user’s project requires being a framework, then your Pod will also become a framework. The excellent playground feature in Xcode 6 provides a great way to create interactive programming examples, but unfortunately only works with Swift. Here’s a library submitted by Krzysztof Zablocki providing an extensive feature set for creating Playgrounds in Objective-C called KZPlayground. IDE agnostic, once you run it, you can modify the code even from vim. Full iOS simulator and access to all iOS features, so you can prototype production ready code. Open source, anyone can contribute to make them better! Nice introduction to CocoaPods that shows how easy is to create and publish your own pod. Two nice articles that explains how you can use Cocoapods with your new iOS / OS X project written in Swift. With DynamicXray you can visualise your dynamic animator live at runtime, exposing all dynamic behaviours and dynamic items. DynamicXray is implemented as a UIDynamicBehavior. This means it can simply be added to any UIDynamicAnimator to enable the introspection overlay. By default, all behaviours owned by the animator will be visualised. This article is focused on mesh transforms. 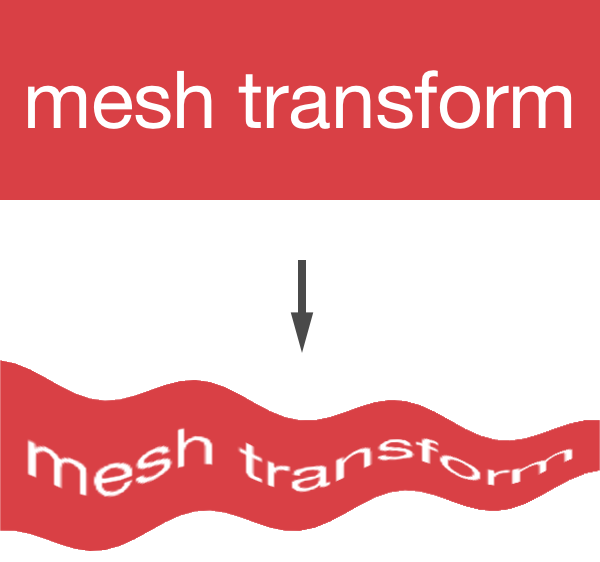 The core idea of a mesh transform is very straightforward: you introduce a set of vertices in the layer then you move them around deforming the entire contents.